Jerusa and I both jumped at the opportunity to design a recipe that resulted in the most realistic-looking poo. 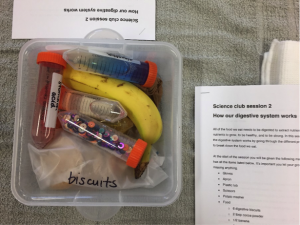 Lesley had shown us an amazing YouTube video that served as a great starting point for planning the second session, ‘How our digestive system works’. We decided to use digestive biscuits as the base since they crumble easily and would help the poo hold its shape. The next obvious ingredient was chocolate (poo is brown of course!). We used cocoa powder, rather than chocolate bars, since it would mix in well. We played around with other ingredients to try to get the texture and colour just right, finally deciding on oats and half a banana. Lastly, we had to experiment with the volume of liquid to use as the ‘saliva’, ‘gastric enzymes’ and ‘stomach acid’. We needed enough liquid to make sure all the contents mashed together nicely, but not too much so that the mixture was still scoopable! The next part to experiment with was the type of tights to use for the ‘small intestine’. We found that sheer tights worked best otherwise it was hard to squeeze out the liquid. The more liquid that comes out, the more solid the poo! As a last-minute addition, we decided to add ‘microbes’ in the ‘large intestine’. We used different sized and shaped sequins to represent our microscopic little friends. We thought it was a good idea to give the kids an idea of how much bigger they are than bacteria. We wanted to also prepare a protocol that the kids could follow which contained all of the facts we wanted them to learn. The most important lesson we learned from watching Holly and Grace run the first session was that we needed to simplify our language a lot! We realised that the first draft of our protocol was going to be hard for the kids to read and understand, so we revamped it and added in some fun multiple choice questions as well as a keyword-definition section for the kids to complete. The poo box! We also provided the kids with a potato masher to help them ‘chew’ their food. To prepare for the big day, we made sure everything was measured out and each group (4 groups of 3 kids) had a kit with all the materials inside. We thought the Falcon tubes gave it a nice, science-y touch! We also made sure to purchase latex-free gloves, aprons, and towels to cover the tables as we anticipated there would be a huge mess to come!